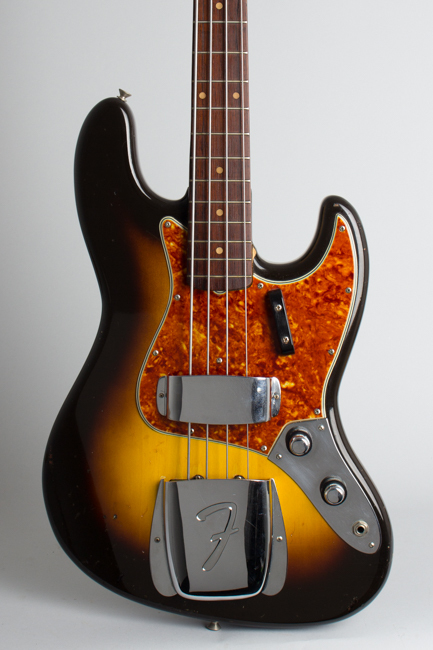 Fender Jazz Bass Model Solid Body Electric Bass Guitar (1960), made in Fullerton, California, serial # 53376, sunburst lacquer finish, alder body, maple neck with rosewood fingerboard, original brown tolex hard shell case. Sometimes superlatives just fail, and you just fall back on "it is what it is". 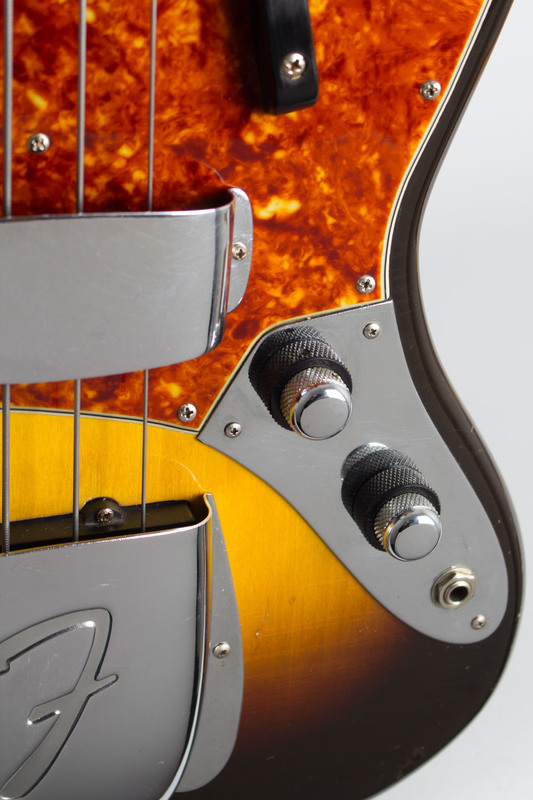 What this is, is a simply wonderful feeling and sounding Fender bass, absolutely one of the finest we have ever had. 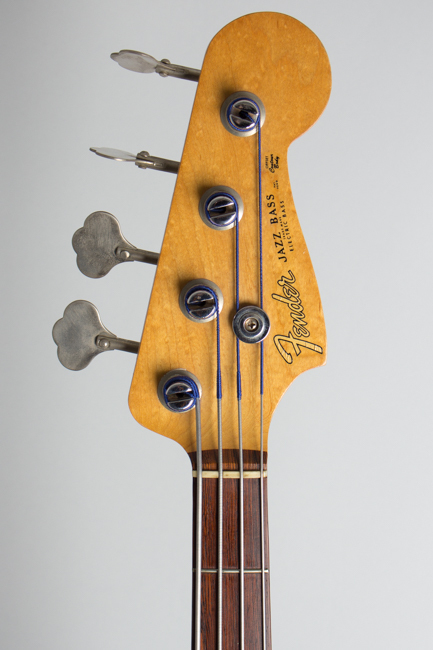 It is also a pretty rare find well into the 21st century -- an early "stack-knob" Jazz Bass in completely original, unaltered condition. These first Jazz basses have long been considered the cream of Fender's output, and playing this one it is easy to see why. 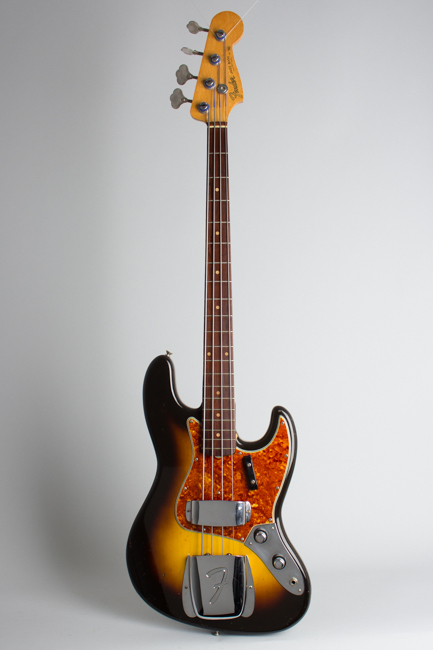 The introduction of the Jazz Bass represented a major step for Fender, and for the electric bass in general. 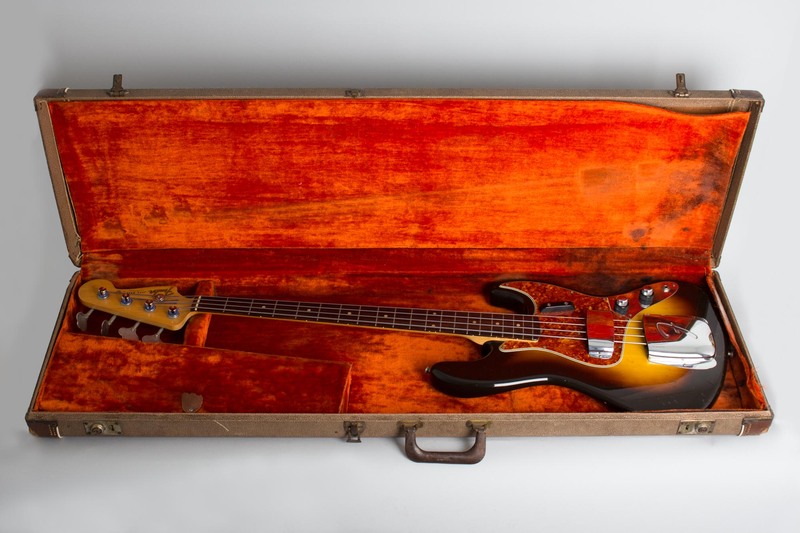 By 1959 the Precision Bass had been on the market for eight years or so, and Fender saw increasing competition in the 4-string market they had pretty much created. 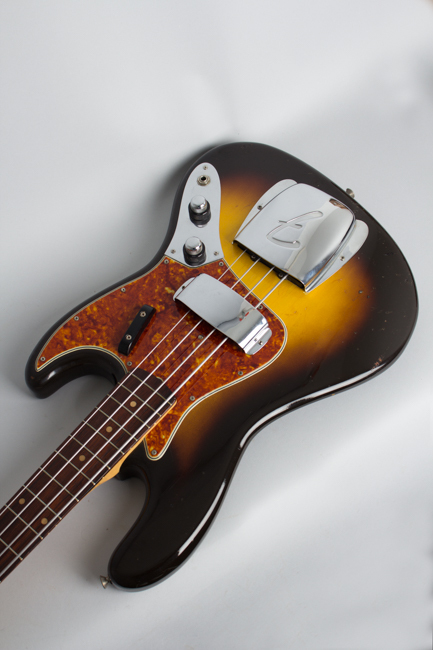 The Jazz Bass was designed to be the upgrade model, the hot rod of the electric bass world. With the sleeker "offset" body adapted from the Jazzmaster and a much slimmer 1 1/2" nut width it had a racier look and feel than the Precision. The two slimmer-cased, multi-pole pickups offered a much wider range of sounds, with a sharper attack and more definition to the tone. The new model was officially introduced in summer 1960, although the first production samples were shown in March that year. 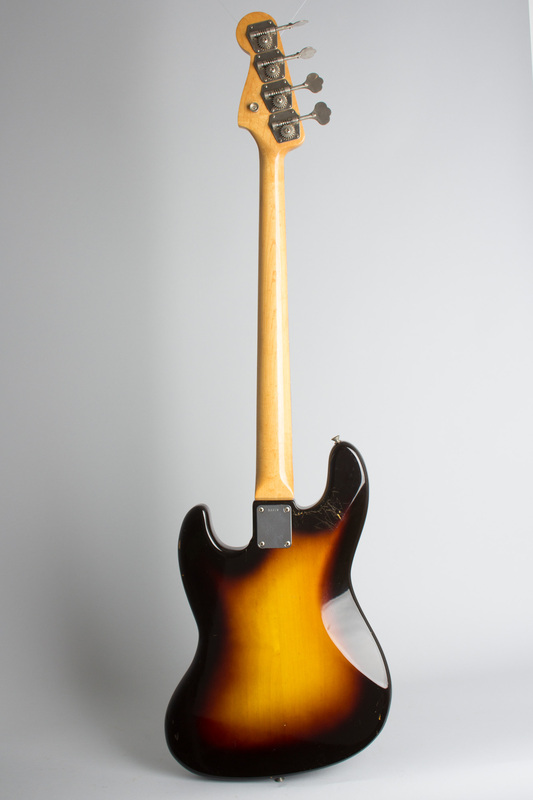 This bass' neck is marked 9-60 in pencil on the heel, which is just about when the first real production of the new model got under way. Typically Fender sales would show samples to dealers at the summer NAMM show, take orders and then tool up to produce what the dealers were expecting in the fall. 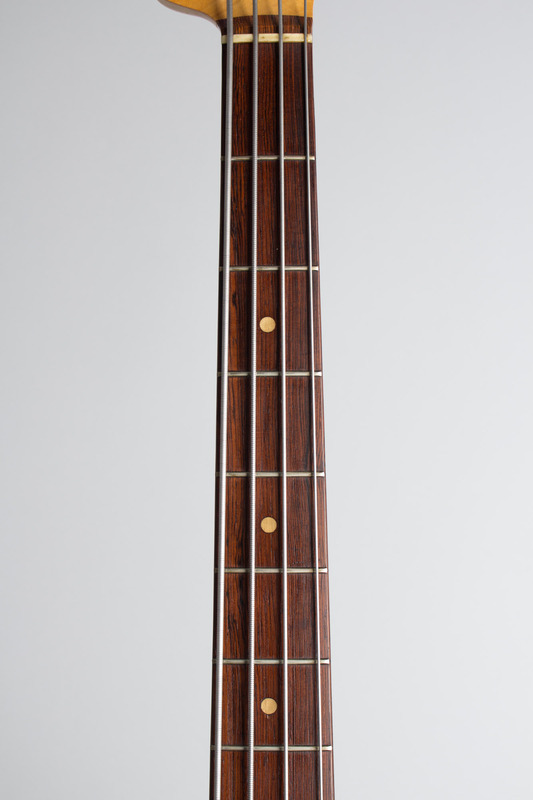 This bass carries early examples of the two-on-one pots that give the "stack-knob" its nickname, with concentric knobs mounted on one shaft. This arrangement allows individual tone and volume controls to be offered on a relatively small control plate, and was pioneered by Danelectro (hey, even Leo borrowed ideas!). 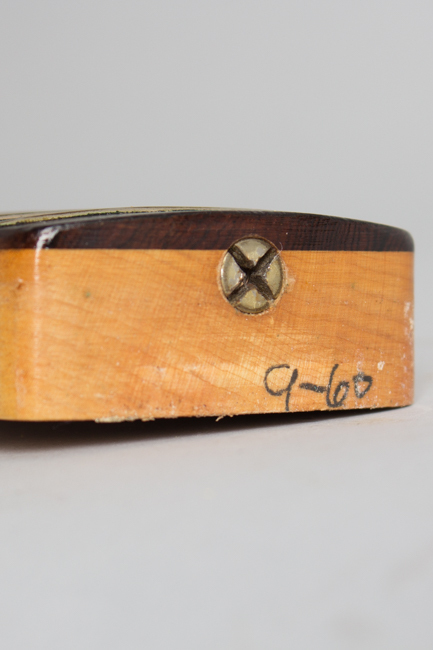 The pots on this bass are stamped to the 25th week of 1960. This bass also has all the other signature hallmarks the characteristic of the first-year "stack-knob", including (under the tailpiece cover) the spot where four individual string mutes were once mounted, and an outside metal grounding strip running from the pickup to the bridge. The lightweight alder body carries a well-faded sunburst finish; it actually looks rather like a 1957 two-tone. 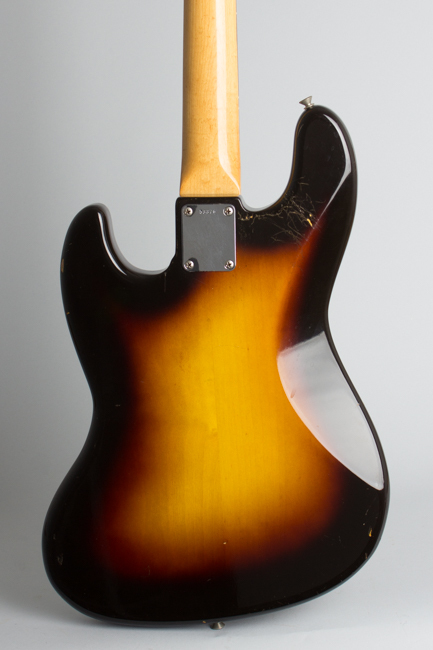 The pickguard is a very light and attractive "pepperoni colored" tortoise celluloid, typical of this period. The large chrome coverplates are still intact, and even the unusual pan head screws that secure the rear cover and control plate are still intact. Relatively light at 9.25 lbs. and perfectly balanced, this Jazz Bass handles beautifully and has a very well-defined, singing sound with plenty of character. 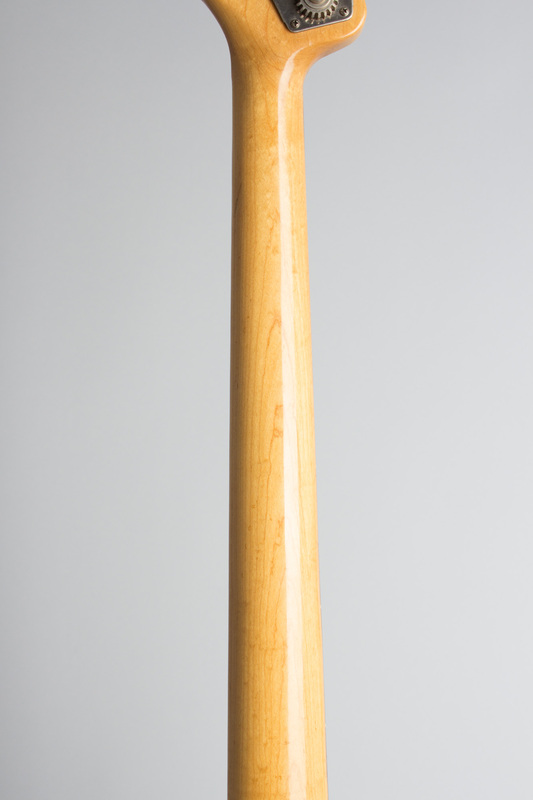 The clay dot, slab rosewood fingerboard neck is very slim and exquisitely comfortable. This is one of the finest Fender basses we can imagine and carries a serious vibe for any Jaco fan, vintage-obsessed bass player, or classic Fender bass connoisseur. Fender's introductory promo sheet claimed the instrument "represents the standards to which others will be compared" and for once even the ad copywriter was understating the case! Overall length is 46 in. (116.8 cm. ), 14 in. (35.6 cm.) wide at lower bout, and 1 5/8 in. (4.1 cm.) in depth, measured at side of rim. Scale length is 34 in. (864 mm.). Width of nut is 1 1/2 in. (38 mm.). This bass remains in fantastic all original, unaltered condition with some light typical playwear, but shows no major finish loss and no alteration. The body has numerous small dings, dents, and chips, but no large areas of finish loss. The face is remarkably clean compared to most surviving examples, with some small dings and filled-in chips visible here and there. The only large chip is on the treble side of the neck pocket. As noted, most of the red pigment has faded from the exposed areas, leaving a very 1950s two-tone look to the finish overall. The back of the neck is quite clean, with some very minimal wear, but again far less than most extant "Stacks". The original small frets are still intact, with the very thin wire showing some light wear to the crowns but still perfectly playable -- this bass likely spent most of its life set up with flatwound strings. The "slab" fingerboard itself shows only minimal wear. The headstock decal shows some light puckering but no flaking. The electronics appear completely untouched with all unbroken solder joints, the pickups still showing lacquer on the poles. The individual string mutes are long gone, but everything else is original down to the last screw. This bass plays and sounds exactly as it should, a testament to Fender at their absolute best. The original brown Tolex case is heavily worn, but still does the intended job. 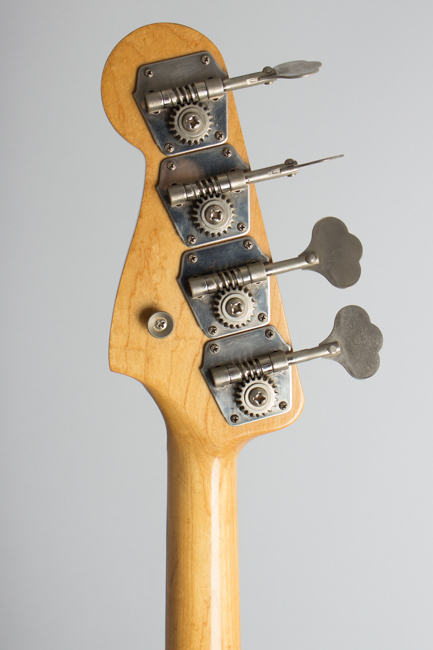 This is easily the nicest "stack-knob" Jazz bass we have had, a real treat for any "bass maniac". Excellent - Condition.